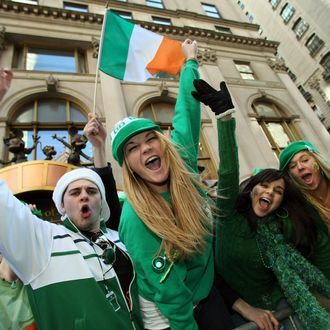 St. Patrick’s Day isn’t until March 17, but some people just couldn’t wait to get the big puke-fest started: Hoboken, New Jersey’s fourth annual Lepre-Con bar crawl took place on Saturday, with a brief interruption caused by a homeless man setting himself on fire. NJ Advance reports that the police were called to Bloomfield and Fourth streets — the center of the green-tinted action — at around 11 p.m. When they arrived, the man was in flames in the middle of the road. While officers “shouted to the man to get on the ground to extinguish the fire,” he “remained standing, but began screaming as the fire started to spread from his jacket to his skin.” Eventually, the cops jumped on him and extinguished the blaze. The guy “was not seriously injured,” but he was taken to a hospital anyway. Meanwhile, Hoboken’s police chief said that as of midnight, his department had made nine arrests for crimes such as assault and drug possession. He also said that there had been “44 total violations of city ordinances barring public drinking and urination.” Tune in for much, much more next week.